Spending more money on your kids' activities than your future career? Spending on kids’ activities is grand…but are you prioritising their ball-kicking over your future career? 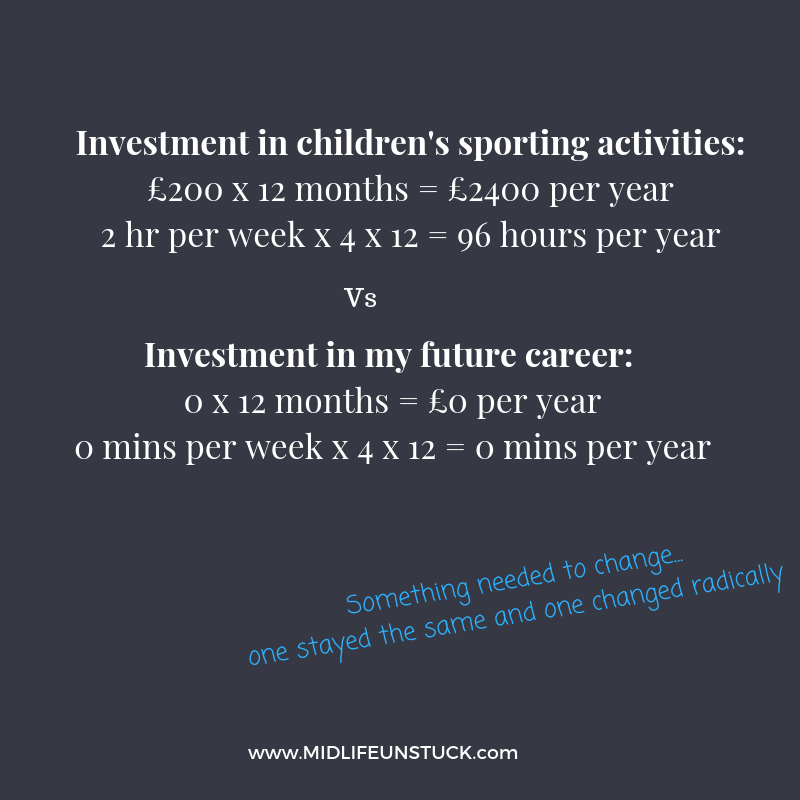 4 years ago, I realised that while we were spending around £200 each month on my daughters’ swimming, netball and gymnastics classes, I was spending £0 on my future career. We were paying a nanny to take the girls to their weekday lessons. For the weekend classes, my husband and I would spend a couple of hours escorting them to their lessons where they learned how to do a decent frog kick, perfect a roly poly and shoot a hoop. Adoring mum as I am, I had a fairly good idea that neither of my daughters were headed towards the Olympic circuit. But I was clear that I didn’t want to be doing what I was doing for the next 20 years. When I noted down what was happening, it was the slap in the face I needed. The notes from my wake-up call that promoted a re-think of my career strategy….from non-existent! The slap in the face I needed. It dawned on me that I hadn’t invested a penny of my own money nor a moment of my precious time improving my chances of doing more fulfilling work in my future. Sure, I was attending work events and doing training courses paid for by my company (which of course were designed to make me better at my current job). But for the previous 3 years, I hadn’t prioritised my future career AT ALL! When I was honest about it, my long-term future career hadn’t even made it onto my to-do list FOR YEARS. 1. I was flat-out making my then career-family combo work (at least to a level where I was neither afraid for my job nor breaking as a human. For the record, I had returned to work after my first daughter mid 2008 when all hell was breaking loose in the financial world). 2. I didn’t know what I might like to do in my future work. 3. I didn’t know what I might like to do in my future work. I couldn’t admit this out loud and do nothing about it. A bit of common sense leaked in, as my Dad might say. I sensed that I’d be in the same spot, in the same industry, possibly in the same company, in five years, if I didn’t do something. Oddly, I’d begun to sense that the silent but deadly 50-year-old corporate toast phenomena would be rearing its ugly head sooner rather than later. I began to invest a little time and a small amount of cash into learning new things. Why? To give me hope, through action, that I wasn’t going to be doing the same thing forever. To give me, however small, a sense of control over my future. · Khan Academy – Fairly academic on-line courses on everything from programming to engineering and beyond. · Udemy – Unbelievable subject diversity - Speed reading, cartooning, digital painting, social media marketing, photography etc. · YouTube – all major players in every field have a YouTube presence. Try their free stuff first before diving in. · Podcasts – like YouTube, every man and his dog in every field has a podcast or interviews on podcasts. There is so much opportunity to spend your commute learning about something that interests you. Listen while you are doing mundane tasks. If I wasn’t doing what I am doing, I would just walk in mountains listening to weird and wonderful podcasts every minute of every day. Over time, I started to get a sense of where my interests lay. Even though I wasn’t quite sure where I’d end up, I made the decision that I would be doing something for myself. That one decision meant that I could get more specific about what I needed to know and began investing in me. Not bags of cash but more than zero. Do this while you’re getting paid a decent salary. Use at least one of your commutes each day to do something future-focussed that interests you. Even 30mins a day, during your working weeks, adds up to more than 100 hours a year. Imagine where you could be and what you could know in 100 hours! If you are to do anything different, you are going to need to exercise your brain – start before you need to. You never know where you might end up! Older PostFired post 50? Will you ever earn the same salary package again? What if your first career is the wrong one? Should I Stay or Should I Change Career? Change job? Change company? How to make a decision. Fired post 50? Will you ever earn the same salary package again? The fantasy of start-ups after a global career - is it for you?